Preview of the Genex Progeny Test calves. I'm awake, typing this post from my hotel room in Redmond. Four of us from my office are here this week learning about a new program (ARC/PLC) that we'll implement this fall. And since we're just sitting in a meeting room going thru PowerPoint slides, I figured I'd share a few pictures from the Genex Progeny Test calves that I took here at the beginning of the month and haven't had a chance to post yet. Calving is slowing down here as well....over 70% of the cows took to first service AI so the bulk of the calves are on the ground. Now it's just a matter of calving the second service AI which are calving right now, and the pasture bred cows. These pictures were taken really early this month when these calves were just a few days old. This weekend is going to be busy getting ready for the BoBo Sale we're hosting at the sale barn on Wednesday, but maybe I'll have time to get out and get updated pictures of the calves. PS - I've hyperlinked the sire information below each picture so you can check out these new & exciting bulls. This is a Breaking News calf. I haven't had a lot of time to analyze them, but overall they seem like a good set of calves. Long bodied and easy calving. This picture is a Chisum calf - he was our "control" or reference sire in this bunch this year. Since he's a proven sire, we can gauge the other bull's calves against his and have a control group. We've used Chisum for a few years here at the ranch and have been very impressed with his calves. They may not be the prettiest fronted females, but they always weigh like lead. 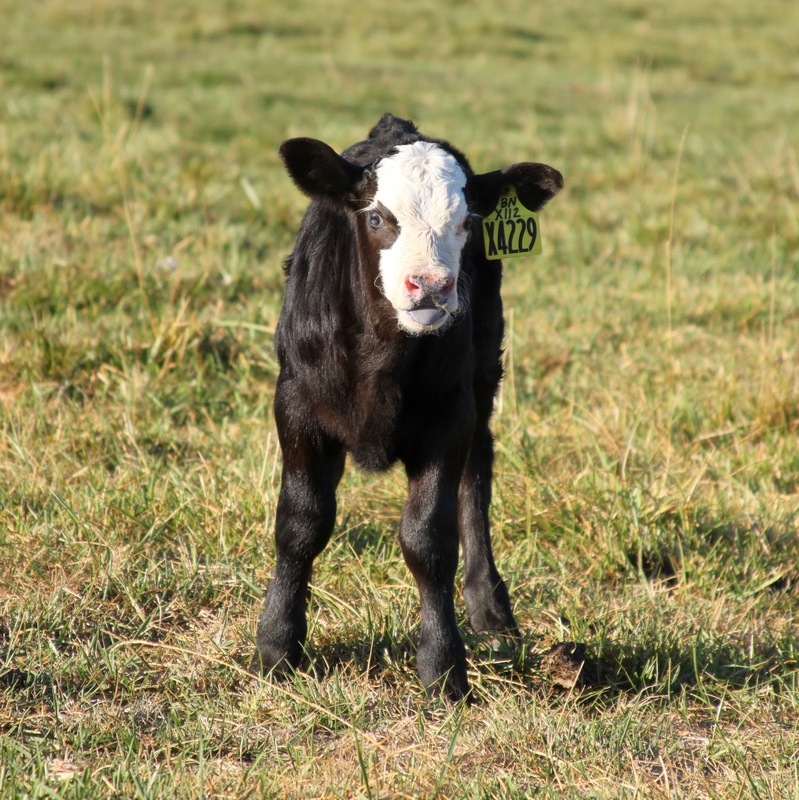 This Balance calf is stout! And cute! This is an Uproar calf....and he wanted nothing to do with me and my camera. He was busy nursing! I thought I'd leave you with this picture of a Breaking News calf that cracks me up - it's little tongue sticking out, searching for more milk to nurse. So just a few pictures of the calves - but I'll post more this fall. The Balance calves look like they will make nice females.